What we ate this summer. Boy, did we eat well this summer! We may have consumed more than our fair share of fresh veggies in a wide variety of simple yet flavorful dishes. What is summer for, after all, if not the consumption of goodies from the farmers market and excuse to work on your tan? Here’s a peek at what we ate this summer. 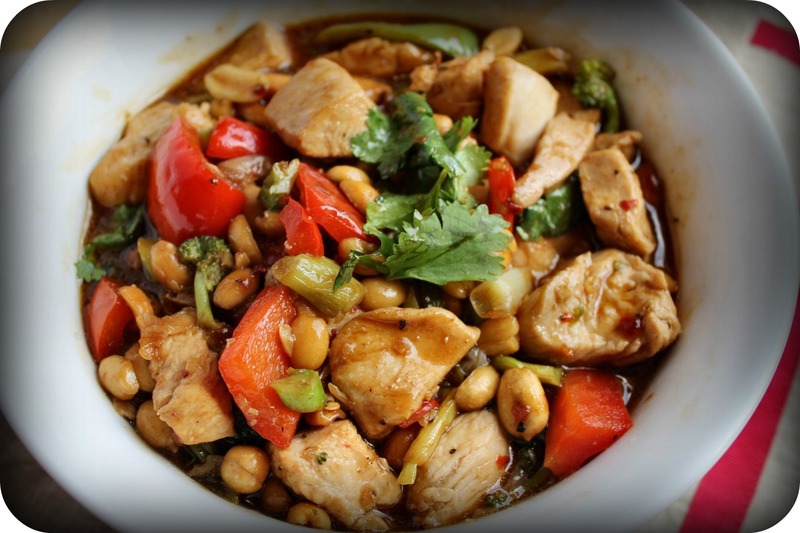 It started with this chicken stir-fry over rice. I’m pretty sure I’ve mentioned this before, but The Complete Package and I love rice. Like L-O-V-E it. You could put a bowl of plain rice in front of us and we’d be happy, but smothering it with this zesty stir-fry made us really happy campers. The recipe came from the Weber’s New Real Grilling Cookbook. Seen it yet? Well, you should. Holy smokes (yes, that’s a grill joke) – it’s exceptional. When I brought this book home from the BlogHer Food Conference in Austin (Thank you, Dole! ), we immediately decided to jump in and try as many recipes as we could as quickly as possible. Here’s another winner from the book. 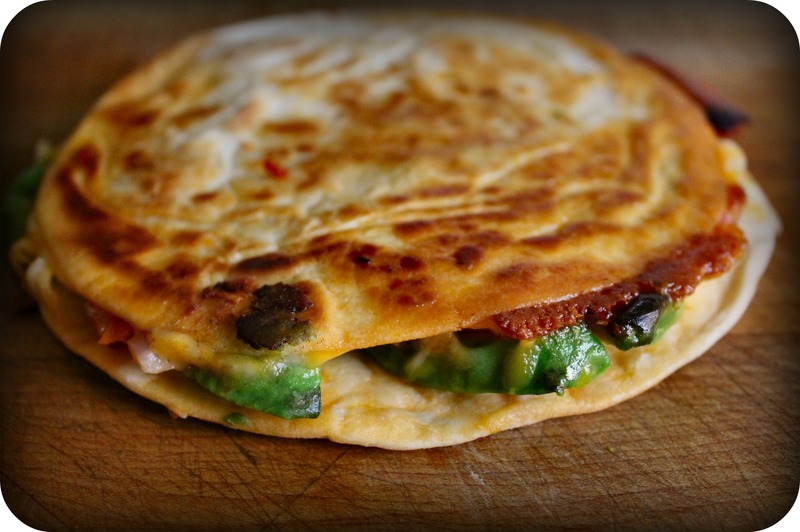 This beauty is an avocado, red onion and sun-dried tomato quesadilla. It’s ooey, gooey, crispy and crunchy. It was meat-free, but it still had it all, and in an easy to eat portable package, too. So much flavor! 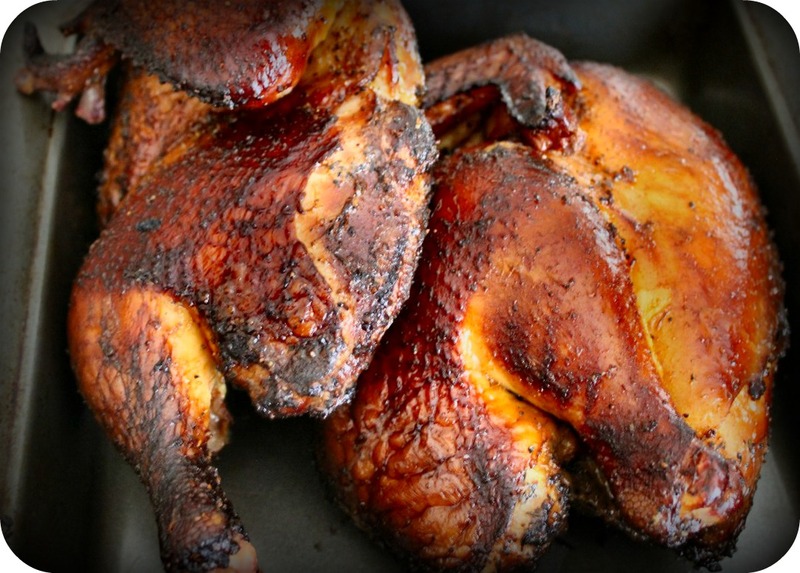 This next one came from an internet search TCP did for smoked chicken. Now that he has officially conquered brisket and ribs (his are to die for), he decided to tackle smoked chicken. The recipe he found was for a ‘competition grade’ chicken, and while I don’t think he’ll be competing anywhere, this bird deserves a blue ribbon. Isn’t it gorgeous? Smokey, juicy poultry in motion. Next was our pizza phase – where we attempted to live out our “More Is More” motto to the fullest. This one was grilled chicken with a smokey BBQ sauce, red onion, sliced jalapenos and a blend of cheddar and monterrey jack cheese. Think that one was loaded? You ain’t seen nothing yet. THIS baby was loaded. I call it “All The Veggies” pizza, and it was an exercise in excess. 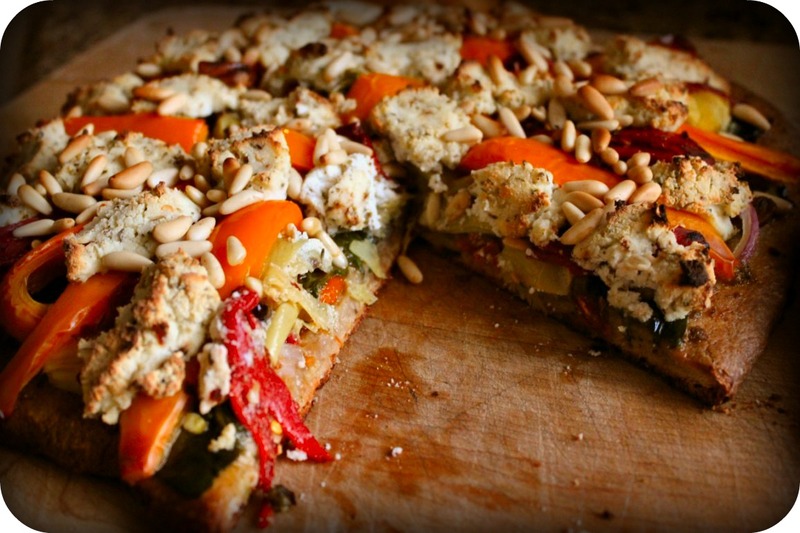 Instead of a tomato sauce, I smeared a whole wheat dough with basil pesto, then layered on oodles of veggies – artichoke hearts, mushrooms, orange & yellow bell peppers, roasted piquillo peppers, fresh spinach, kalamata olives, and red onions – then topped it with ricotta, toasted pine nuts and a drizzle of olive oil. We could hardly pick it up, but the flavors were over-the-top fabulous. Speaking of flavor, this simple dish from the Weber’s grilling book blew our minds. It is deceptive in that it doesn’t look like much, but practically explodes in your mouth. Yummy is an understatement. 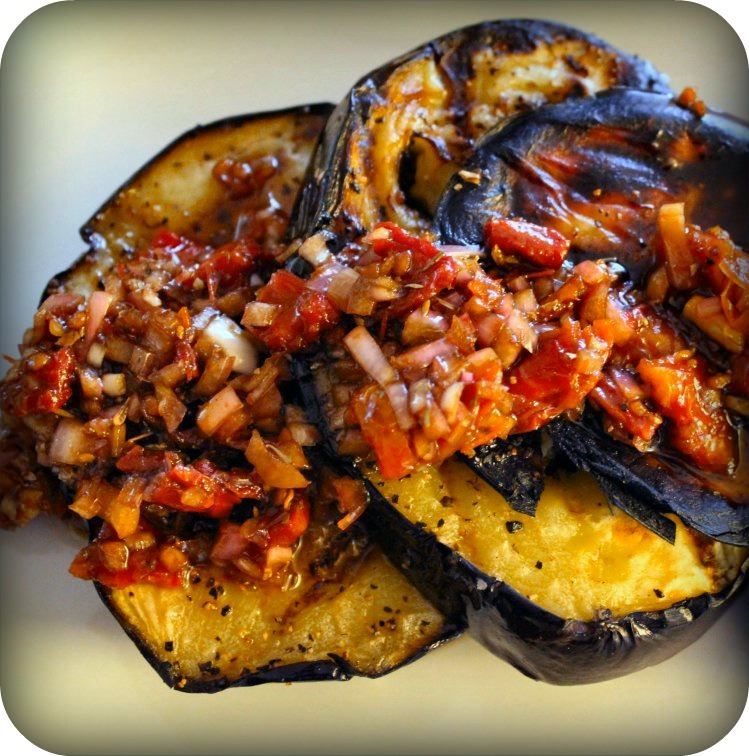 It starts with eggplant grilled over charcoal, which is then topped with a sun-dried tomato, shallot & garlic relish dressed in a balsamic vinaigrette. Wow. Just wow. Next up was a Cuban Sandwich made with leftover smoked pork tenderloin (also from the Weber book), but the star of this show was the tostones we made on the side. Ever had tostones? It’s hard to describe them, but if you ever have an opportunity to try them (or even make them), take it. They’re like thick chips made from plantains. 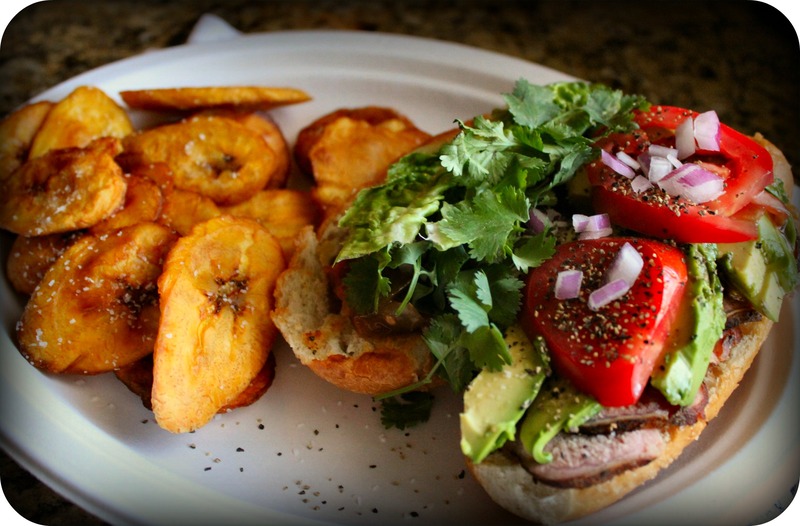 Now, if you think plantains are just fat bananas, you are mistaken. They’re actually starchy like a potato, and unless you let them over-ripen, they are not sweet. Think of them as a potato substitute. To make tostones, peel and slice plantains and fry them in a little canola oil until they just start to crisp a little. Remove them from the oil, drain on paper towels, and flatten them with a metal spatula. Then, and I know this sounds strange, throw them BACK into the oil until they are a golden, crispy brown. Sprinkled with kosher salt & served with your favorite salsa, I promise you will never reach for corn chips again. All this talk of chips and pizza is making me thirsty, which brings me to my last treat of the summer. The fine folks at Double Decker were kind enough to ask if I’d like to try their wine. I don’t think I could have said “Heck yes!” any faster. To my surprise, they sent two full-size bottles – Pinot Grigio (white) and their Red Blend. The red was opened first. We drank half the bottle with a nice steak dinner and used the last half the bottle for Blackberry Sangria. Mmm…. I can still smell and taste it just looking at this photo. My friend Beka pointed out that it appears the ice is giving a fist-bump. Wildly appropriate; it rocked! Blackberry Sangria is my new ‘must have’ for summer. 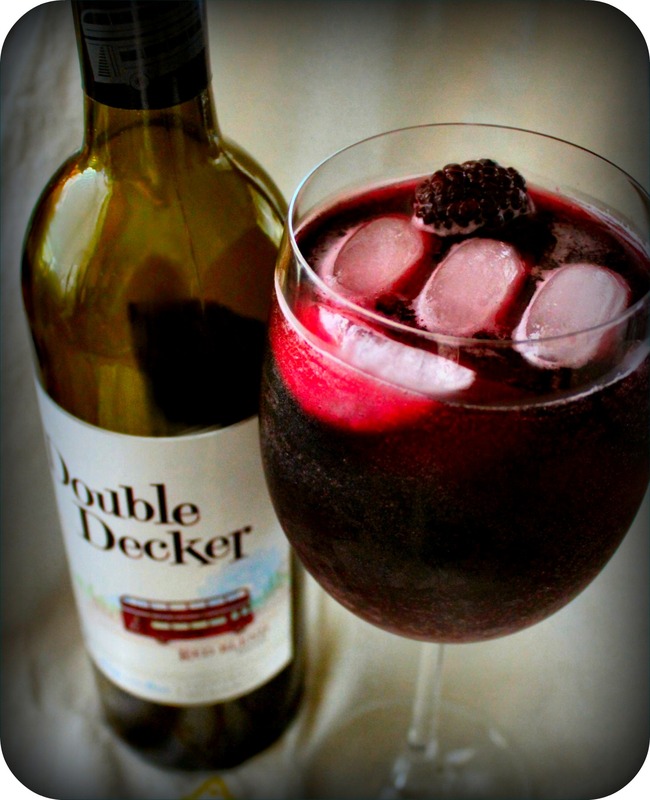 To make, muddle one pint of fresh blackberries with 1/3 cup of sugar and add to a bottle of Double Decker Red Blend. Cap it and put in the refrigerator for at least 24 hours so the berries & wine can fall in love. Then strain and serve over ice with a few fresh berries for garnish. So good, and so refreshing. This would also work with red plums or raspberries. The pinot grigio is superb and crisp on its own, but also makes a great summer sangria with the addition of peaches, apples, orange slices and a handful of white grapes. If you lika de’ bubbles, top it with a splash of champagne, club soda or lemon-lime soda. Then sit back and reflect on a summer worthy of the record books. Did you try anything this summer that knocked your socks off? Do tell! 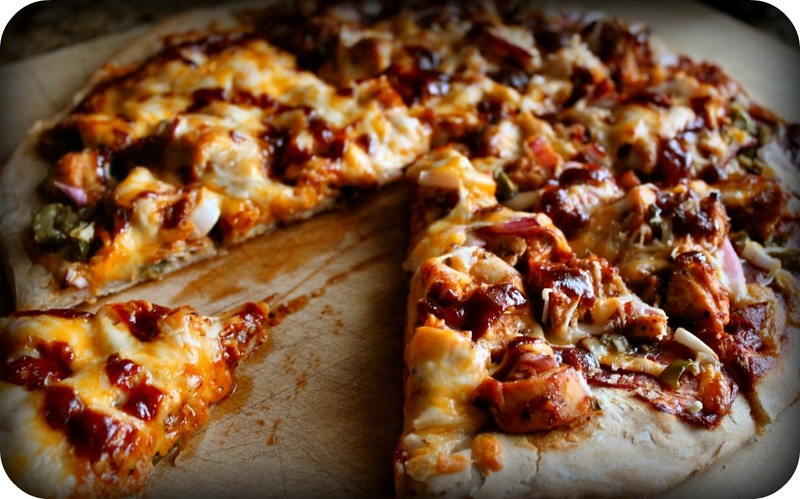 BBQ chicken pizza is move favorite! I’ll be honest, Thoughtsy- BBQ pizza has never been one of my favorites. This one, however, went a long way towards fixing that. Know what else I love? Buffalo Chicken pizza – with a zippy wing sauce and lots of gooey cheese. Give me the spicy stuff, and I’m a happy camper. The big 2-story across the street is still for sale. That is a pretty impressive summer of eating, Jeanne! Your grill got a major work out! Was that stir fry cooked on the grill too? I’m with you on the wonders of rice. I could quite happily consider rice my main dish with or without anything on the side! And my favorite dessert….rice pudding! We did eat some really great stuff this summer, at least 75% of which was grilled or smoked it seemed. The stir fry was from the Weber cookbook and was intended to be done on the grill but inclement weather forced me to use the stove and a wok. Still delicious, but could easily be done either way. And I love rice pudding, too! Really, just rice in any and every form, any way I can get it.